Firefighters, Fire Administrators and those who support them, we need your help. 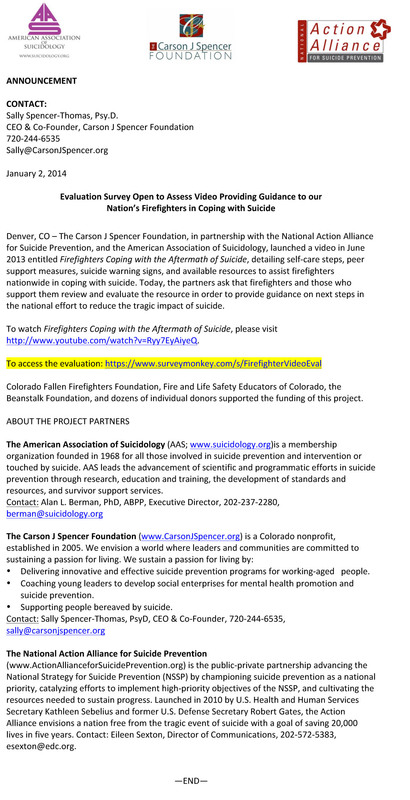 The Carson J Spencer Foundation, in partnership with the National Action Alliance for Suicide Prevention, and the American Association of Suicidology, launched a video in June 2013 entitled Firefighters Coping with the Aftermath of Suicide, detailing self-care steps, peer support measures, suicide warning signs, and available resources to assist firefighters nationwide in coping with suicide. Today, the partners ask that firefighters and those who support them review and evaluate the resource in order to provide guidance on next steps in the national effort to reduce the tragic impact of suicide. To watch Firefighters Coping with the Aftermath of Suicide, please visit http://www.youtube.com/watch?v=Ryy7EyAiyeQ. This entry was posted in Blog, News by Scott Chisholm. Bookmark the permalink. Reading about these foundation and better yet they have a goal gave me a big sigh of relief. On March 31 would have been my youngest son 43rd birthday and some memories of talking to police and detectives comes back. One man was really trying to ask questions kindly and really listened to me. One policeman was in shock as much as myself. That was in 2010 and a few months ago I was in a car accident. The firefighters police and ambulance personnel were obvious very trained as to their speech and behavior around me. No emotional outbursts or loud talking about their dogs. Their focus was getting me out of the wrecked car safely. What a difference.